Prehistoric Rock Art, Engravings, Carvings, Stone Reliefs. on Ochre Stone, around 70,000 BCE. earliest art of Sub-Saharan Africa.  What is the Difference Between Petroglyphs and Rock Art?  What Are the Oldest Petroglyths?  What Type of Petroglyphs Are Cupules?  What Was the Purpose, Function or Idea Behind Petroglyphs?  What Are the Most Famous Petroglyphs? What is the Difference Between Petroglyphs and Rock Art? Whereas a petroglyph is a narrow type of stonework, the term "rock art" is a much wider term which embraces three types of art: (1) Petroglyphs; (2) Pictographs, including cave painting or any other form of pictorial symbol; and (3) Megalithic Art, or petroforms, involving the arrangement of stones (eg. Stonehenge stone circle, Salisbury Plain, England). Neither Venus figurines nor other types of prehistoric sculpture, like the Lion Man of Hohlenstein Stadel, or the animal ivory carvings of the Swabian Jura, are classified as petroglyphs, because they are portable rather than parietal (fixed to a rock surface). What Are the Oldest Petroglyths? The oldest art in this particular category of prehistoric rock carving are the Bhimbetka Petroglyphs in the Auditorium cave situated at Bhimbetka in India. Excavations at a sister site (Daraki-Chattan) have confirmed that the petroglyphs were created between 290,000 and 700,000 BCE, during the Acheulian period of the Lower Paleolithic. Cupules are non-functional cup-shaped depressions found on a rock surface which are created by a number of human blows. The rock surface at cupule-sites usually shows microscopic signs of percussion, such as particles of crushed material, surface bruising, and occasionally signs of tool marks. They are most common type of petroglyph in the world. What Was the Purpose, Function or Idea Behind Petroglyphs? It is impossible to generalize. A cupule, for instance, is a fundamentally different type of rock marking from (say) a relief sculpture or an animal engraving. As yet, no archeologist has provided a coherent explanation for the creation of cupules, while other types of rock engraving may serve as territorial maps or markers (geocontourglyph), or ritualistic, religious, totemic or linguistic markings. A recent study of the rock carvings produced by the San Bushmen of the Kalahari desert, was conducted by the Rock Art Research Institute (RARI) of the University of the Witwatersrand. It discovered a number of connections between this tribal art on the one hand, and San culture and religion (including healing and rain-making) on the other. For more about the cultural background to Stone Age carvings, and other parietal rock art, see: Paleolithic Art and Culture. Other important petroglyphs were the carvings and engravings found on megaliths at Gobekli Tepe, Newgrange and Stonehenge. What Are the Most Famous Petroglyphs? Cupules carved on quartzite rock at Auditorium Cave, Madhya Pradesh, Central India. Technically, the oldest cave art on the planet. Rock engravings at Indragarh Hill, Madhya Pradesh, Central India. Abstract engravings on ochre rock, 200 miles east of Capetown, South Africa, representing some of the oldest art yet found. 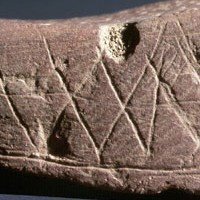 For more about its crosshatch designs, see: Prehistoric Abstract Signs (40,000-10,000 BCE). Cupules on a Neanderthal tomb at Les Eyzies, Dordogne, France. See also: Aurignacian Art and Culture (40,000-25,000 BCE). Neanderthal stone etchings on dolomite in a cave on the southeast face of the Rock of Gibraltar. The oldest engraved drawings known to Franco-Cantabrian cave art, they were discovered on the underside of a huge collapsed ceiling block, in the French Dordogne. World's largest collection of petroglyphs, Pilbara, Western Australia. Note: For other sites of Aboriginal Rock Art in Australia, please see: Ubirr Rock Art in Arnhem Land (from 30,000 BCE), Kimberley Rock Art Western Australia (30,000 BCE), the Gabarnmang charcoal drawing (26,000 BCE) in Arnhem Land, and the famous Bradshaw Paintings (Gwion) in the Kimberley (c.15,500 BCE). Animal engravings in the Ardeche Gorge, France. Engraved drawings of animals, fish and seals, first produced during the era of Gravettian art, around 25,000 BCE. Large scale engraved drawings of Stone Age animals. Although perhaps best known for its chilling hand stencils, Gargas also contains a wonderful collection of large scale animal engravings. Includes some 150 engraved drawings of prehistoric animals. Bas-relief sculpture in limestone rock at Les Eyzies de Tayac, Perigord, Dordogne, France. The oldest prehistoric open air rock engravings in Europe. Renowned for its animal engravings in the Axial Gallery, the Apse, the Nave and the Chamber of the Felines. Petroglyphs featuring more than 100 engraved drawings of horses, ibexes and bison, plus a number of images of female genitalia. This Dordogne rock shelter contains more than 200 engravings, as well as prehistoric hand stencils and handprints. Boasts numerous engraved drawings of human faces. Has a massive collection of 600 engravings of animals. Limestone petroglyphs in Addaura Cave, Monte Pellegrino, Italy. See: Magdalenian Art and Culture (15,000-10,000 BCE). Animal and abstract designs in Northern Cape Province, South Africa. The best-known Mesolithic art in Saharan Africa, it consists of archaic-style engravings at Tassili-n-Ajjer, Algeria, North Africa. Coloured engravings on quartzite in Western Cape Province, South Africa. "Simple figurative" images of people, animals and ideomorphs - carved in the sandstone around Sydney, NSW. See: Neolithic Art (c.6,000-2,000 BCE). Taureg culture rock engravings at Agadez, Niger, Africa. Neolithic spiral engravings near the main entrance. See: Newgrange Megalithic Passage Tomb. Famous neolithic stone monument, located on Salisbury Plain, UK. Neolithic geometric carvings, lunar maps and sun-dial on mound kerbstones. See: Knowth Megalithic Passage Tomb.  For information about painting and sculpture, see: Visual Arts Encyclopedia.